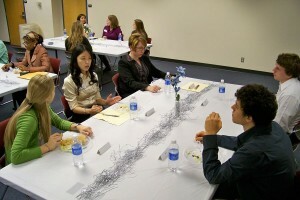 Students in Stacy Greathouse's ENG 101 course at a recent professional dinner. On a recent Thursday night, tucked away in a corner room in an otherwise quiet Stevenson Hall, 14 freshmen taking their first writing course at Illinois State were completing a very important assignment – a dinner date with four particularly judgmental strangers. They had planned the 2-hour dinner entirely on their own, securing and spending $100 in Department of English grant money, buying gondolas, decorating the room, picking music, even researching the four invitees who would eventually evaluate their professionalism and etiquette. It’s not an exercise you might expect in a Composition as Critical Inquiry course, but that’s by design. Stacy Greathouse’s students are getting a broader understanding of genre – a key concept in Illinois State’s revamped Writing Program – defined as a way of providing labels in a particular category. Stacy Greathouse, center, sits at a table with her ENG 101 students and dinner invitee Jessica Shichi Zhang, second from left, on November 8, 2012. Students may know different music genres, but they may not know the same principles apply to, say, relationship genres – romantic, familiar, professional, etc. And that means the professional dinners become both an academic exercise and one that tests the social skills they’ll need when they hit the job market. “They’re composing a relationship (with the invitees). That’s all it ever comes down to,” said Greathouse, a former career counselor now working on her doctorate at Illinois State. Molly Triveline, a freshman theatre and social studies education major from Gurnee, expected her first-semester English class to be all about writing papers. But she said Greathouse’s course has been refreshing, especially its emphasis on “authentic assessment,” where the instructor isn’t the only one giving evaluations, and the feedback students get is narrative, not numerical. For the professional dinners, for example, the four invitees – professionals who come from diverse backgrounds – fill out scorecards after the event with their own impressions of individual students and how they behaved. Those ratings weigh heavily on a student’s final evaluation on the assignment. Greathouse started doing the dinners in fall 2011, and this semester, both of her ENG 101 sections are doing them. The students – 14 in one class, 19 in the other – divide up into six different committees. Each is tasked with researching and then teaching the class about etiquette, or preparing the food. At their core, the dinners are giant problem-solving exercises, with students finding democratic ways to plan an entire dinner on a shoestring budget, even down to agreeing on the background music. A composition is anything someone creates within a particular genre. So even though they’re not pumping out five-paragraph essays, Greathouse’s students are constantly composing – the menus, the research about the four invitees, the etiquette lessons for their classmates. “You name it – that becomes a genre,” Greathouse said. The Writing Program at Illinois State is dedicated to developing innovative theories and methods for teaching writing in a student’s first year, and Greathouse says that freedom allows for dinners like these. Her students also embraced an earlier assignment when they had to write a letter to someone, such as a company, seeking resolution to a complaint. Alex Strauss, a freshman accounting major from Deerfield, said he likes Greathouse’s teaching style in part “because she’s not the only person who grades us.” For the “resolution letter” assignment, Strauss wrote a letter to Fender after he broke a pick while playing the guitar one day. His prize: Fender sent him a pack of three picks. “And that was half my grade,” Strauss said. During the recent Thursday dinner, it was clear students were taking full ownership of the event. The freshmen, all dressed in business casual attire and sporting name tags, were more than cordial with their guests, even offering to take their coats, all the while looking to leave an impression in conversation. They had a stake in the dinner – far more than any five-paragraph essay assignment could provide.